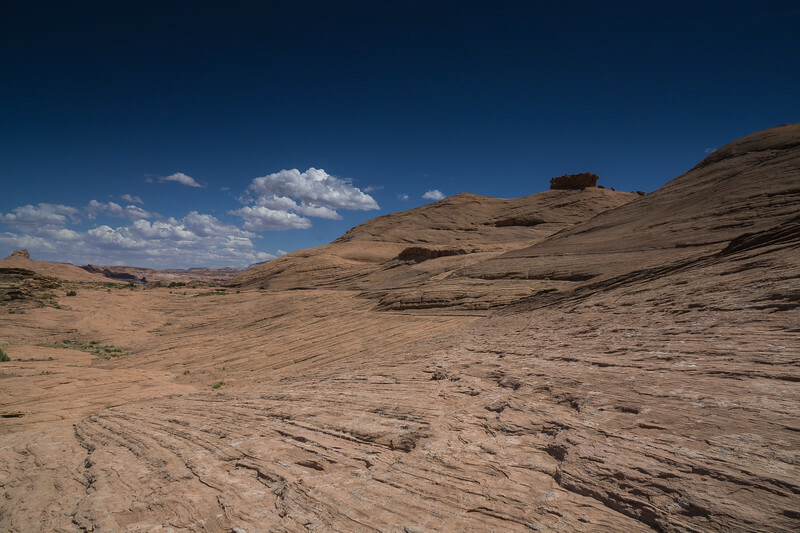 A roughly 10-hour drive to Escalante Utah from San Diego, brought me to Hole in the Rock Road where I drove 50 miles down a dirt road to hike 10 miles through the desert to see the beautiful Reflection Canyon. Reflection Canyon was the high point of the trip, but it was one heck of an adventure to get there! 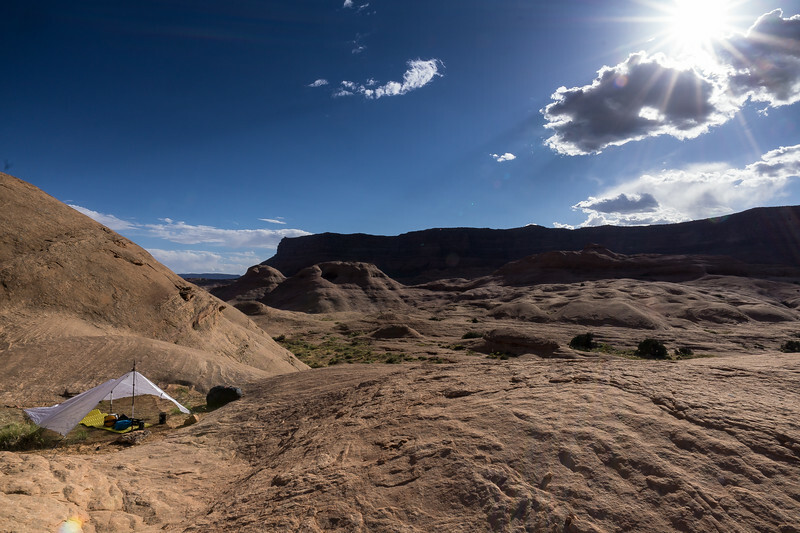 If you are going camping in the Escalante Grand Staircase National Monument, you will need to obtain permits from the visitors center. The permits are free, and it's always great to let a 3rd party know your location and your plans. 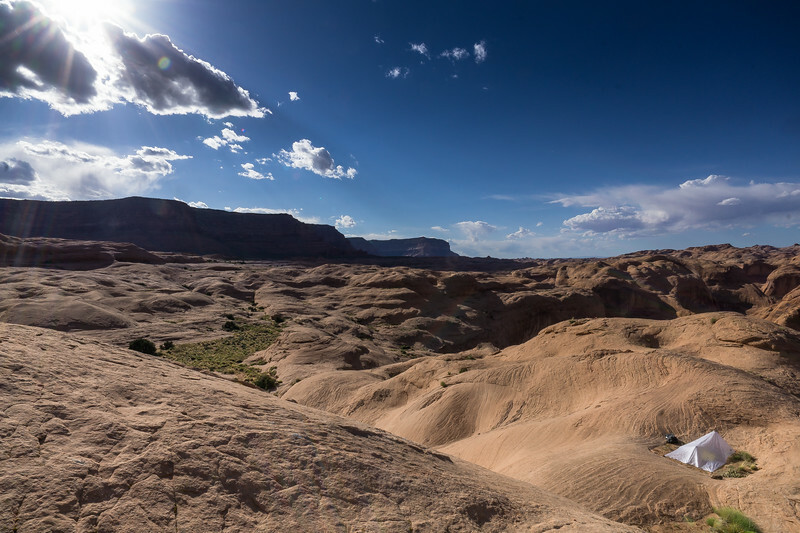 You can find the Escalante Visitors center on Google maps here. Just about a mile or so from the visitors center is Hole in the Rock Road, which begins a 50-mile drive down to the start of the hike. The beginning of Hole in the Rock road can be found on Google maps here. 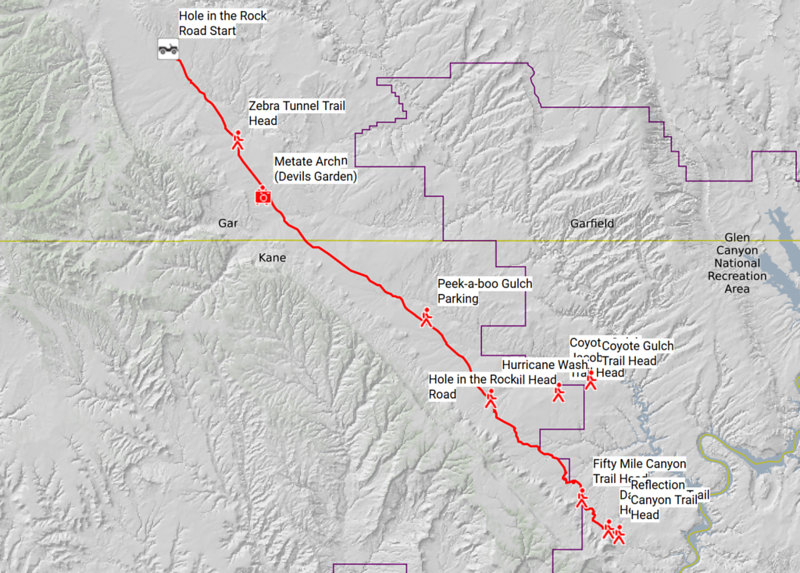 You can also check out my custom map on Caltopo of Hole in The Rock Road . The map as pictured below also has some (not all) other trailheads and sights to see while on the road. Hole in the Rock road starts out pretty easy, just a regular calm dusty dirt road. 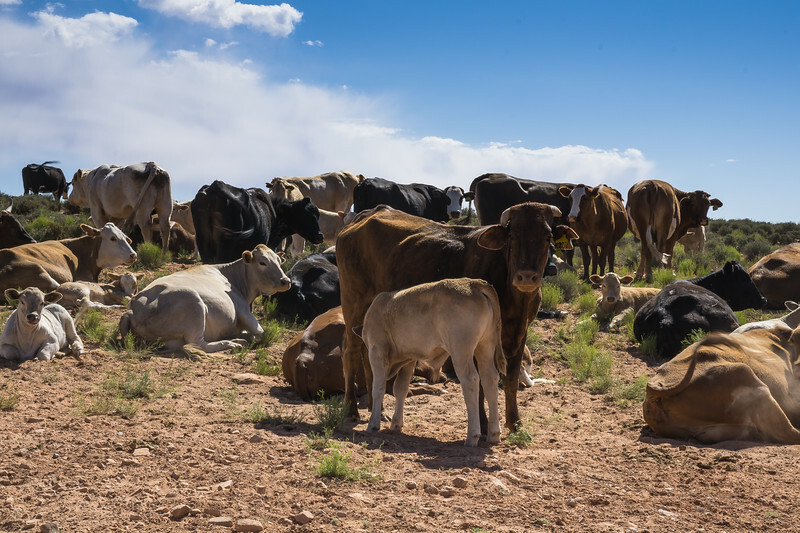 Unless of course, you run into a herd of cows. Other than the cows crossing Hole in the Rock Road, I saw plenty of non 4×4 low clearance cars driving towards their own adventures. 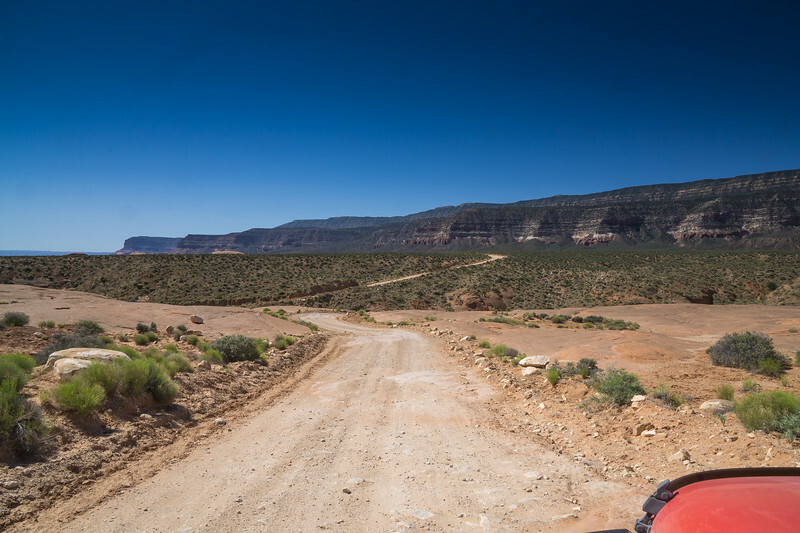 The road starts out nice and wide and allows for pacing slower cars if you are comfortable in your 4×4. There were a bunch of quads driving down the road, which I was initially worried that they were going to be annoying but everyone seemed nice, and they all let the cars pass them. 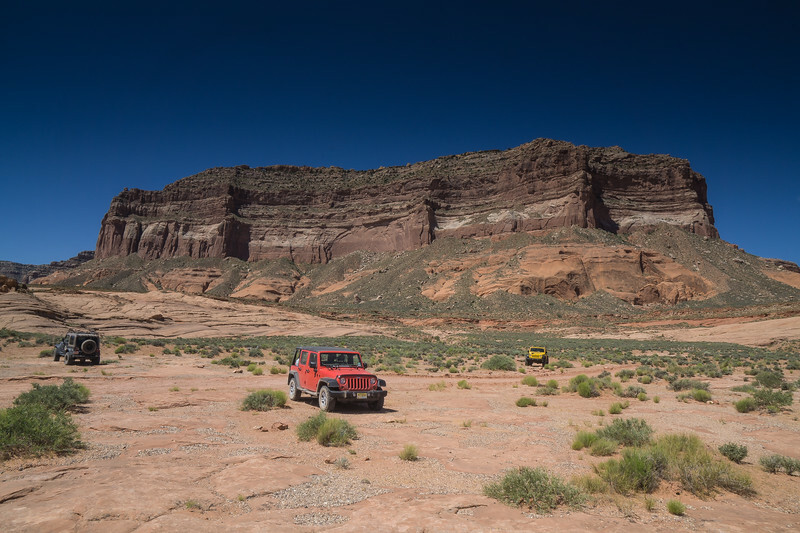 As I got closer to where the Reflection Canyon hike would start, the road became a bit more technical, and I recommend a 4×4 with high clearance if you are traveling this far down the road. When I got to the area I would be parking at, I saw two other Jeep Wranglers already there. I smiled at the fact that I only saw Wranglers at the end of the road, but other vehicles eventually made it down that far too. 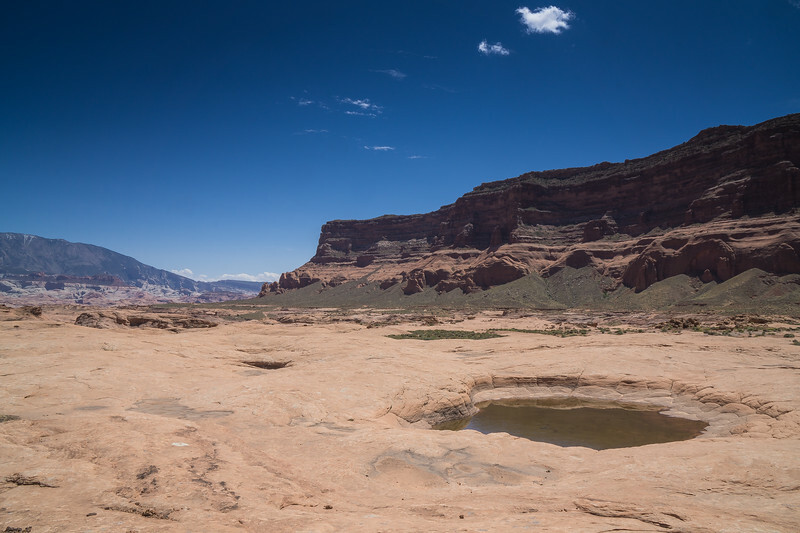 When I parked, there were no signs saying this was the start of the reflection Canyon hike. There was also no designated “parking lot.” I brought along custom made maps and had marked the starting location on the maps, to know where I should start. Before you venture out on this hike, I want to give a little bit of a WARNING: This hike does not have an established marked trail. There are at times throughout this hike where it may look like a “trail,” but it is just a bunch of footprints from others who probably downloaded the same GPS route as yourself. If you rely on following this “trail” as your only means of navigation, you will probably get lost. 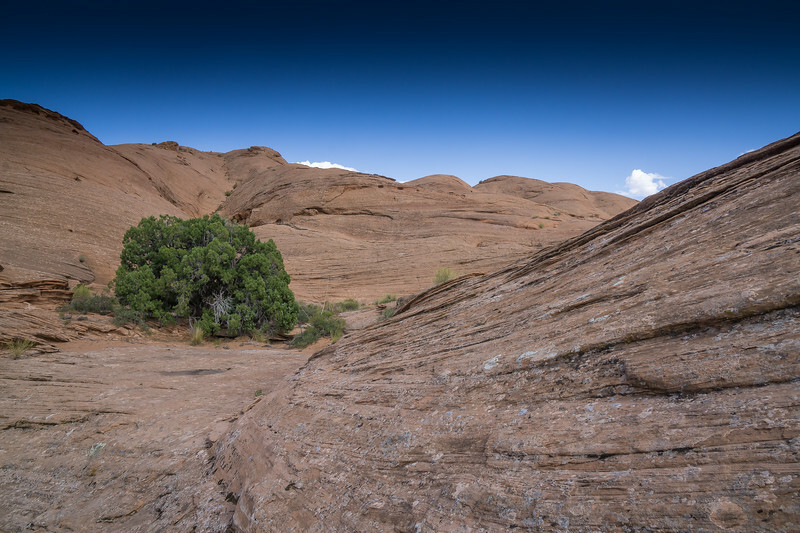 There are large sections of this hike over large rock formations with no markings. Also never rely solely on a GPS, no how to navigate with a map and compass. With the warning out of the way, I must admit I did not take the best route on the way out to the Canyon. The Canyons off to your left when you start the hike may look interesting, but it was safer and smarter to stay high and to the right. The picture above was taken early on in the hike, and I am way to far off to the east, I should be more west and closer to the plateau. 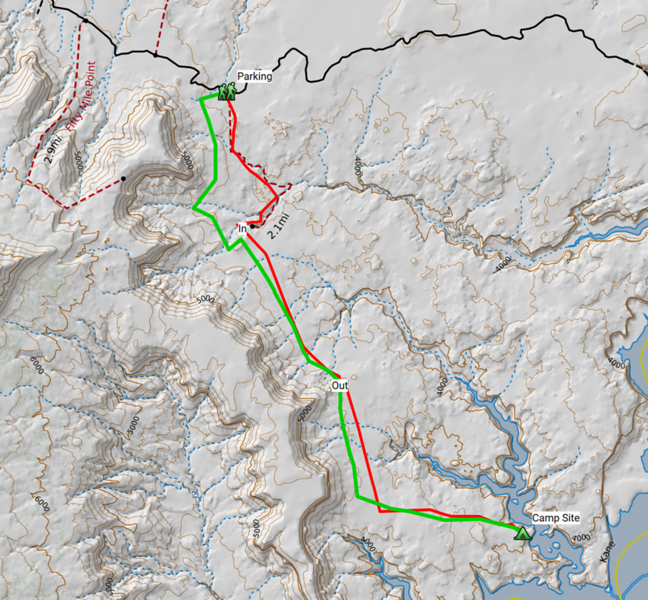 In the map below you can see my rough path out which I do not recommend (Red), and my return trip which was more on the “trail” (Green). You can also download my hike on Caltopo here. If you zoom in on the Caltopo map link on the red path, toward the beginning, you can see where I run straight into a slot canyon, and have to trace it until I find a spot where it is shallow enough and safe enough to climb down across and out. 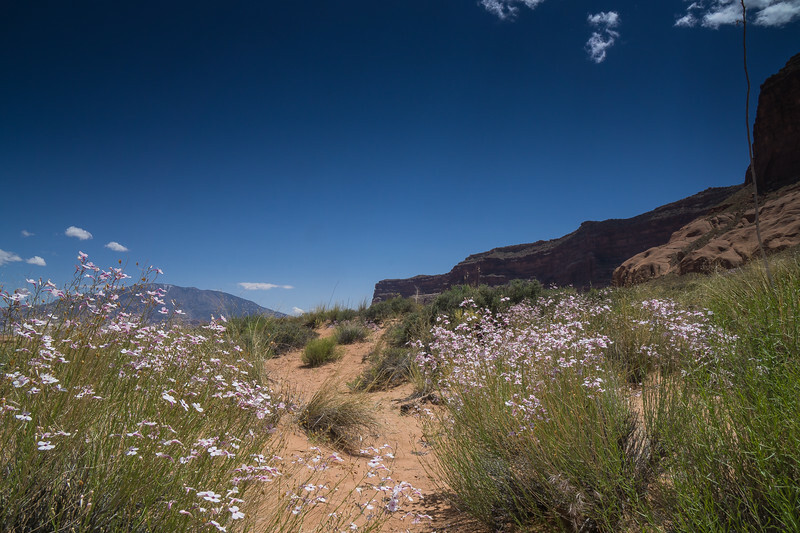 Other than the slot canyons and not much of a marked trail to follow, I found the hike pretty easy. 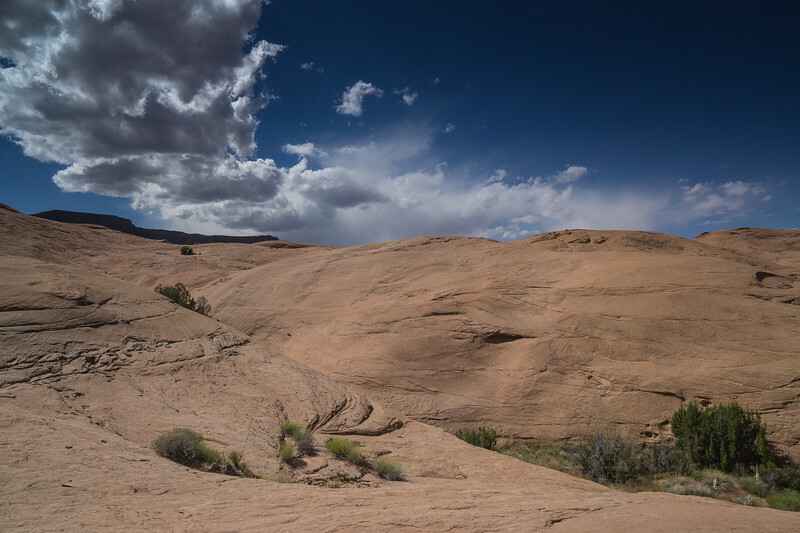 If you are an experienced navigator, the hills were not bad at all compared to hiking in the Sierra Nevadas, and I was able to make great time once around the slot Canyons. 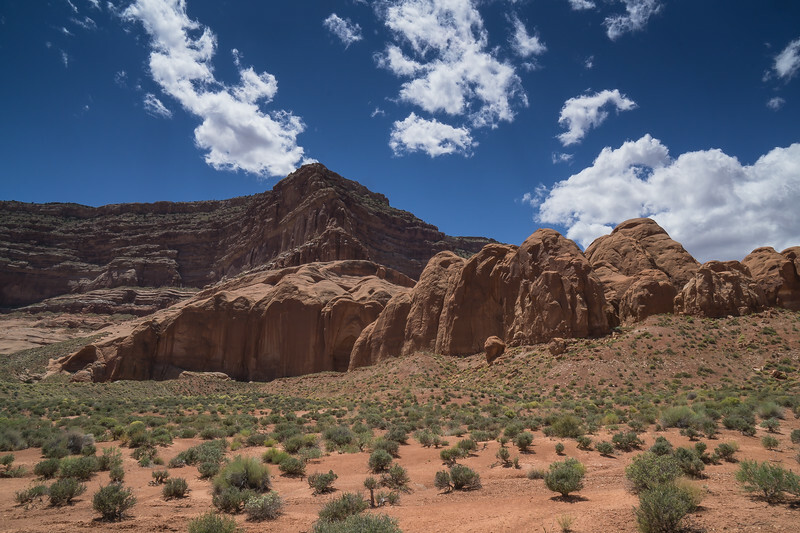 I do recommend you bring plenty of water because there are not many places to fill water along the trail until you are closer to the end. 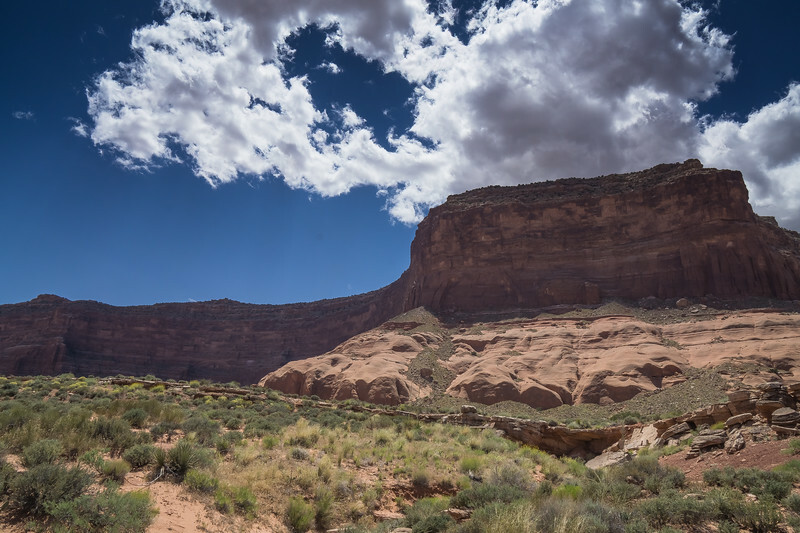 As you near Reflection Canyon, the path turns from red dirt and brush to solid rock. 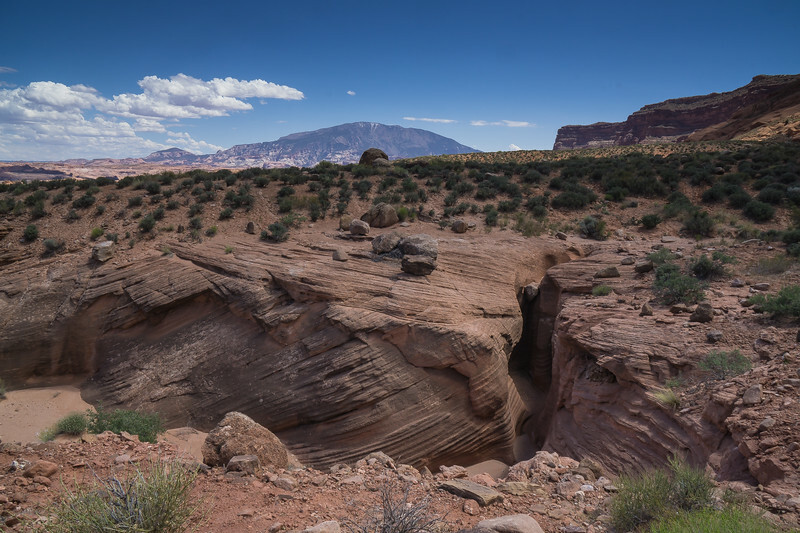 This is where you will lose the footprints to follow if you are relying on the “trail.” As you move across the rock formations, this is where you may find watering holes, but there is no guarantee that they will be full when you arrive. This past winter was pretty rainy, so I was able to stumble upon a few watering holes, but I would not plan on these. I brought enough water to get me in and out without having to find and filter. I was also very fortunate to have some mild weather, and it was not to hot. If you are looking to haul some extra water, I recommend the MSR Dromedary which is what I brought along. 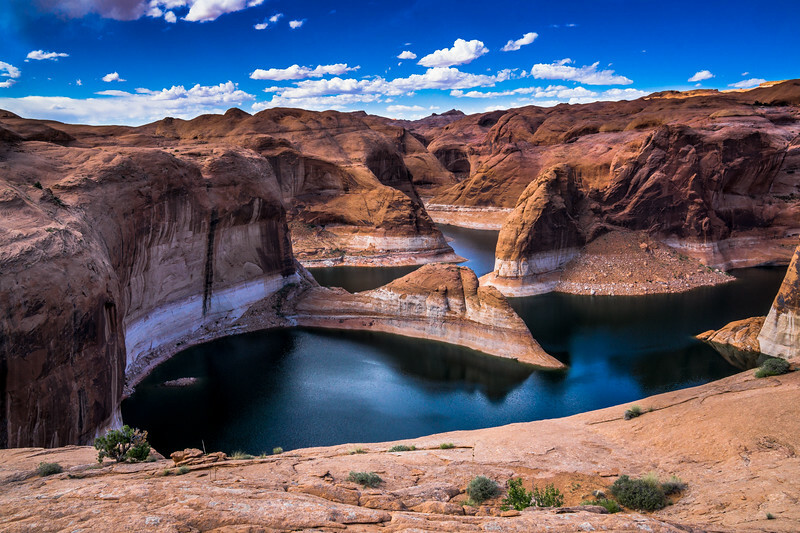 The closer and closer you get to the spot with the best view of Reflection Canyon, the more the path becomes one giant rock and less desert sand. If you are relying on the “trail” of footprints, this could be a hard place for you to navigate if you do not have a great sense of direction. 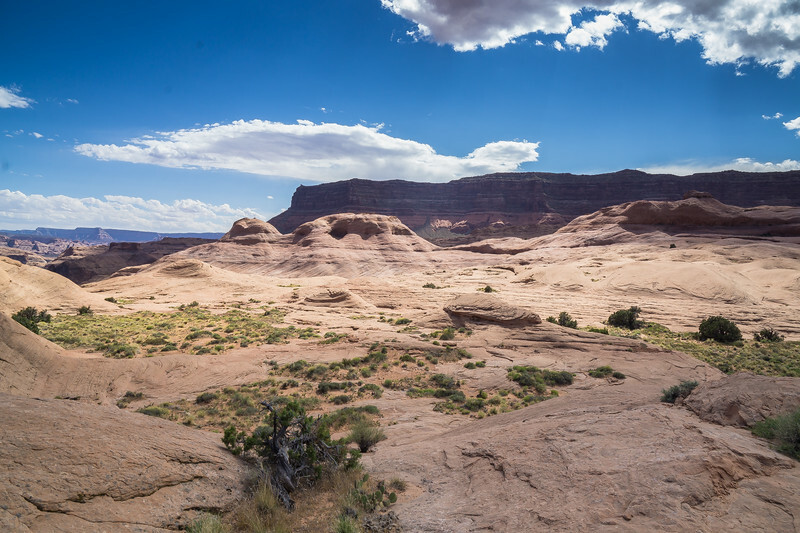 Once I came out onto the rock face part of my journey, I pulled out my map and compass and pointed toward a prominent terrain feature to take a bearing and used the terrain feature as a reference point while I hiked toward Reflection Canyon. As you move south-east over the rock, you will slowly slop down to a small sandy bowl which was fairly green as a result of the wet winter. 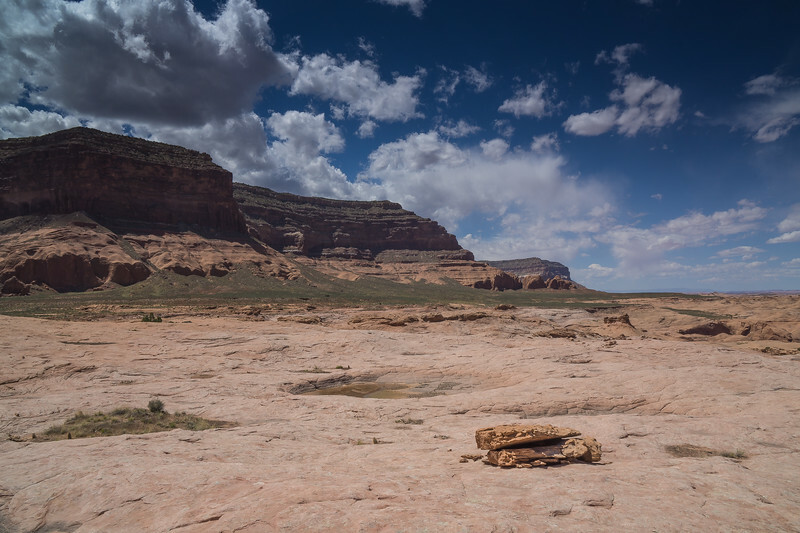 This green bowl area is fairly flat and is an excellent place for groups to camp and individuals to camp who do not want to camp up high on the bluffs overlooking reflection canyon. From the bowl its a quick climb up to the viewpoint of the canyon below. 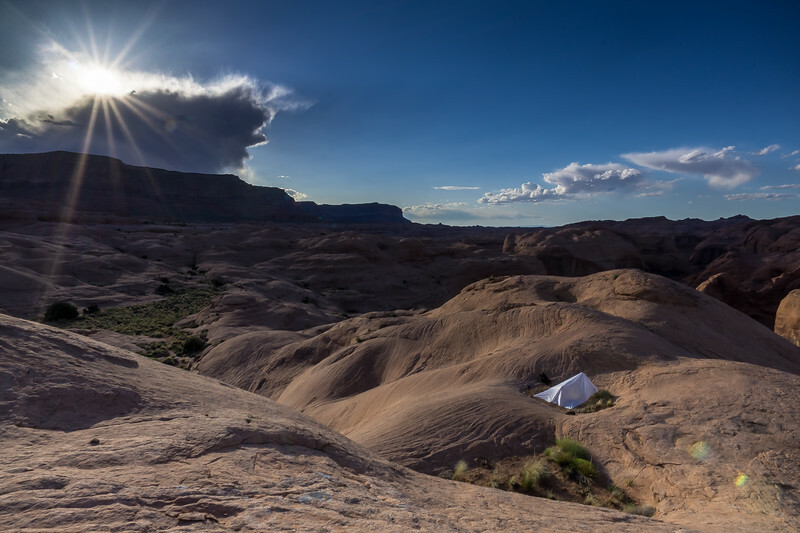 If you are considering camping at the top, I would bring a bivy because there is not a lot of flat ground to set up an entire tent. 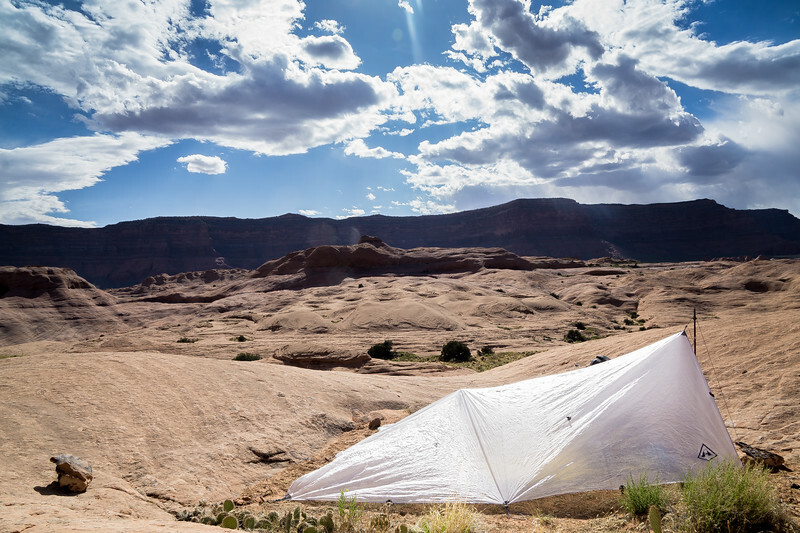 In fact, I only found one flat sandy place where I was able to use stakes to pitch my tarp I brought. If someone is there already then you will either have to cowboy camp on the rocks or walk back down to the bowl. I will have some pictures of my campsite and set up shortly. 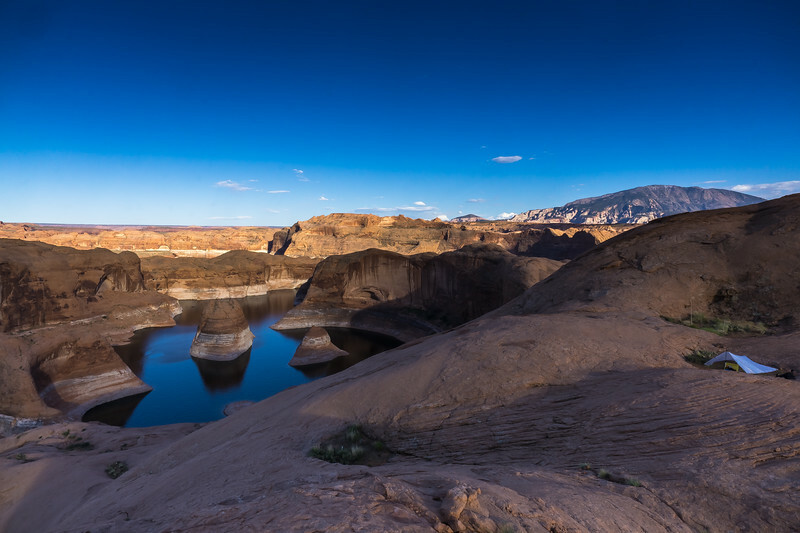 If you approach the Reflection Canyon viewpoint from the North West, you will be treated to another fantastic view of the water below which is not where the famous picture was taken. I found this part amazing in its own right, and I stopped here for a while before proceeding up to the top of the rock face for the iconic view towards the South East. After a bunch more pictures I strapped my pack back on and headed for the final climb toward the viewpoint. After hours of driving, a 50-mile dirt road and a whole lot of hiking, I was almost there! Planning this trip, I knew I was not going to see the same beautiful curves that are famous in the iconic photo. I believe the water level when that photograph was taken was at 3600 feet above sea level. When I went, the water level was over 15 feet higher, which I knew going out would hide some of the elegant curves. If you are planning your own trip, you can check out the current and historic water levels here. Because of the wet winter, the water levels were rising daily leading up to and after my trip over memorial day weekend. Even though I knew I would not get the “iconic shot” I went anyway. The reason why I went was to find a remote place over memorial day weekend. There are hikes in this area that are arguably more pretty through the entire hike, but I knew I didn’t want to join the crowds. I figured fewer people would travel down to a place with no established or maintained trail. Also maybe there would be fewer photographers there since the water levels were not at the right height for the “perfect” shot. I also had a plan for another idea of the “perfect shot” involving the milky way galactic center. Either way, Reflection Canyon was stunning, even if the water was a little high. When I reached the top, I was in awe of the canyon below, and I felt on top of the world, and I had it entirely to myself! 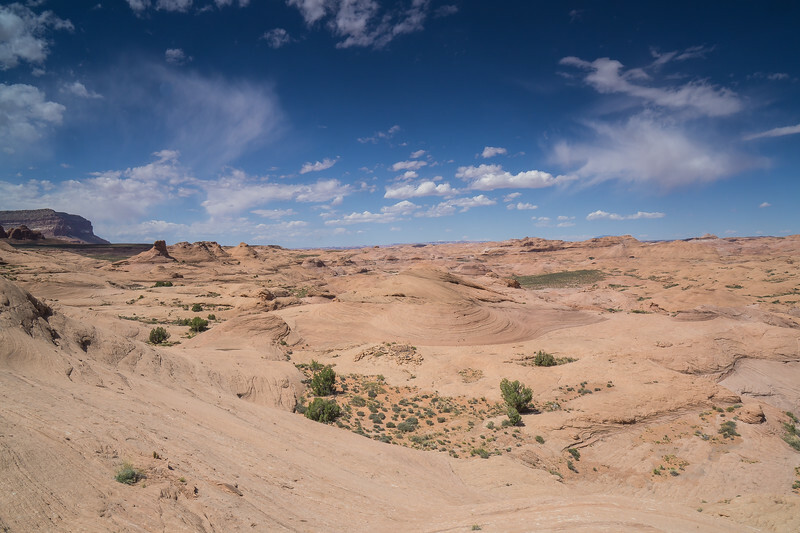 After taking in the view, I walked down from the primary viewpoint and found the one flat sandy spot that had limited vegetation and no cactus in the center. It was pretty warm at this point, late in the afternoon and I was a little tired from my early wake-up. 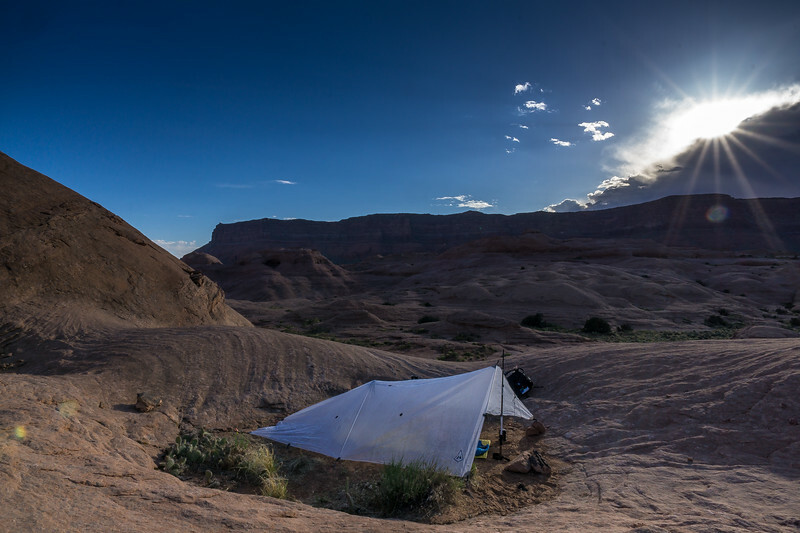 I organized my gear and set up my Hyperlite Mountain Gear tarp marking my camping spot on the rocks high above. 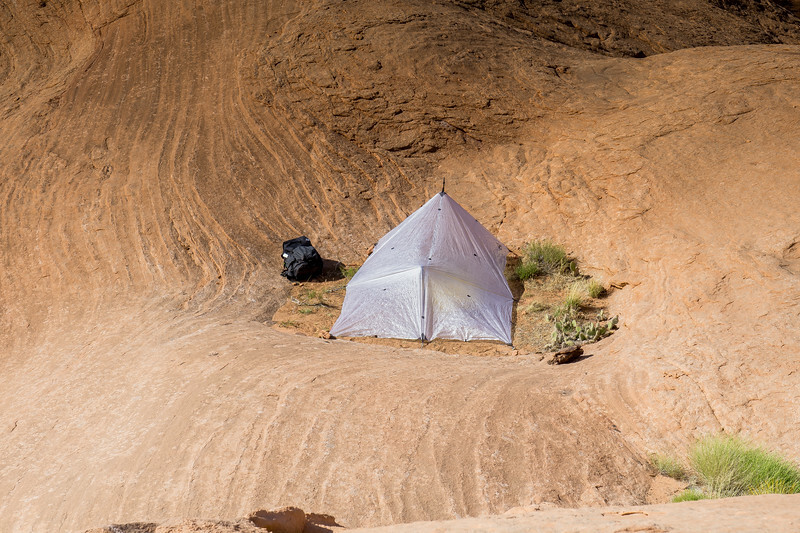 I could not see down to the Canyon below from inside my tarp, but this made me a little bit comfortable since I am not a huge fan of heights. My gear was also safe here, and I would not have to worry about it rolling off a cliff while I went exploring around the area. 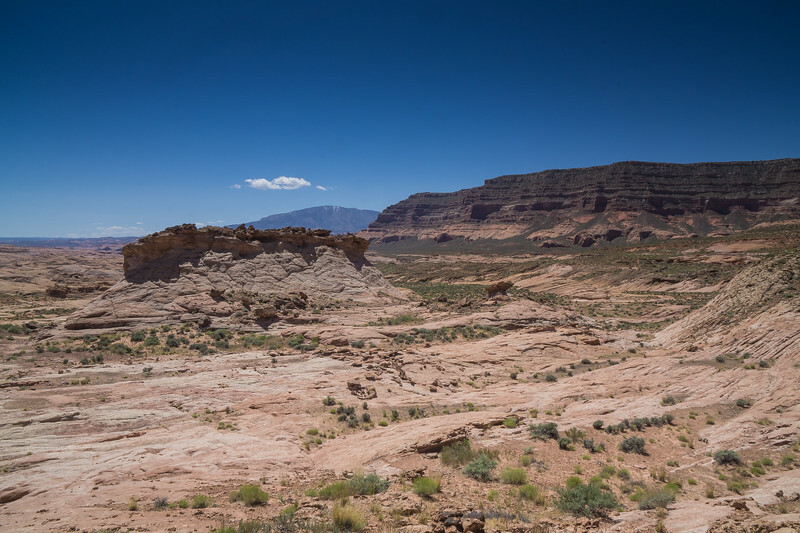 Despite not being able to see the Canyon, I had a great view of the desert and rocks that I traversed to get here. I mentioned I had ideas for another “perfect shot” involving the milky way, and this was what pushed me over the fence to go on this trip. (1) May is one of the best months for viewing the Milky Way Galactic Center in the night sky. (2) This weekend there was almost zero moonlight. Because of the above two factors, it was perfect for astrophotography which I have been trying to get better at. 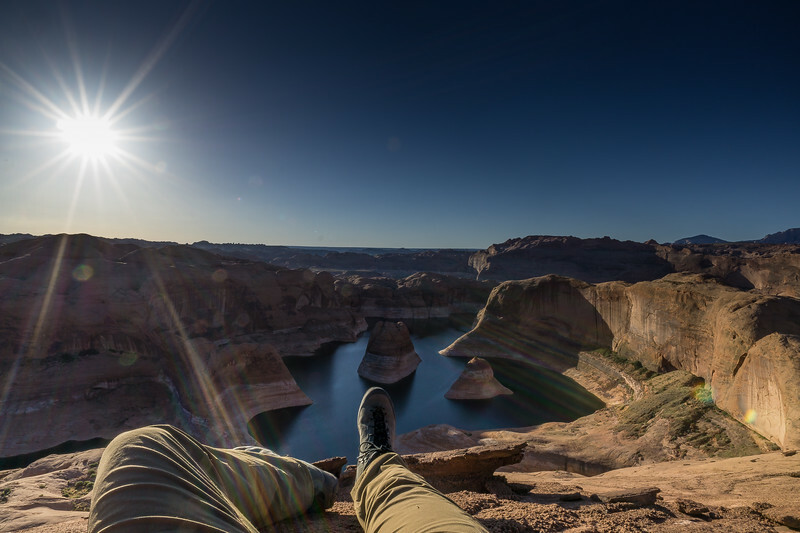 I chose a spot with an excellent view down reflection canyon. I took multiple pictures at different exposures, time of day and differing levels of ISO with my camera in manual mode. Between midnight and 1 am the stars were perfect for viewing the Milky Way Galactic center. 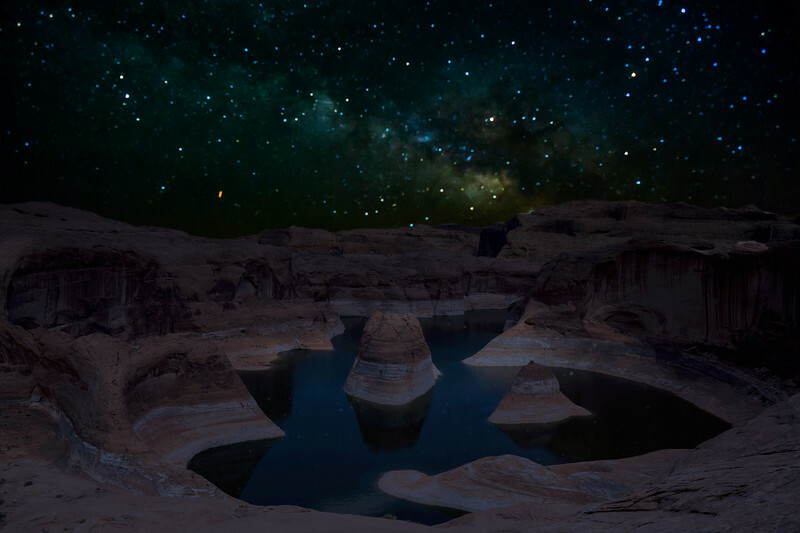 I combined the differently exposed photos so I could see Reflection Canyon and the Milky Way Galaxy. The results, one of the best nighttime views I had ever had in my life. The planning, the drive, and the hike were well worth the few hours I spent photographing the Milky Way.